HP Umpire John Tumpane ejected Blue Jays Manager John Gibbons for arguing a check swing (ball) call by 3B Umpire Alan Porter in the top of the 7th inning of the White Sox-Blue Jays game. With two out and one on, White Sox batter Adam Eaton attempted to check his swing on a 2-1 curveball from Blue Jays pitcher Jesse Chavez. Play reviewed and affirmed as correct by the UEFL Appeals Board (Check Swing). 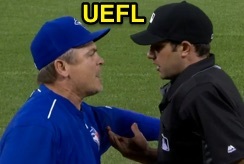 At the time of the ejection, the White Sox were leading, 3-0. The White Sox ultimately won the contest, 4-0. This is John Tumpane (74)'s first ejection of the 2016 MLB regular season. John Tumpane now has ? points in the UEFL Standings (0 Previous + 3 AAA + ? Call-Crewmate = ?). Crew Chief Dan Iassogna now has ? points in Crew Division (0 Previous + ? Call = ?). This is the 13th ejection of the 2016 MLB regular season. This is the 6th Manager ejection of 2016. This is the Blue Jays' 1st ejection of 2016, T-1st in the AL East (BAL, TOR 1; BOS, NYY, TB 0). This is John Gibbons' first ejection since August 8, 2015 (Greg Gibson; QOC = Y [Check Swing]). This is John Tumpane's first ejection since May 21, 2015 (Kyle Seager; QOC = Y [Balls/Strikes]).